5 a.m. and the jetlag continues in London. The Victoria Embankment curves alongside a loop of the Thames in the city center. It’s a nice run in an old city. Lots of architecture from such a variety of historical periods, built over each other like a layer cake. And even better, there are no traffic lights to interrupt the sidewalk along the Thames. It’s a nonstop run. Even before the sunrise, it’s much warmer than chilly March, the last time I ran in London. Heading north, the London Eye sits dormant across the river, blue lights fading in the brightening sky. Bet the sunrise over London is quite a view. But the tallest Ferris wheel in Europe is silent and still. It is too early for tourists. Under the Hungerford Bridge, all industrial piping and railway tracks, past Charing Cross tube station. Past the three and a half thousand year old Cleopatra’s Needle, a huge obelisk transplanted from Alexandria, twin to the obelisk in New York. The park benches that line this section of the embankment are all in the Egyptian theme, with black painted armrests wrought of iron in the shape of winged sphinxes. Passing under the Waterloo Bridge and Blackfriars Bridge, already vibrating with the early morning vehicular traffic, the sidewalk narrows and drops below the level of the road. Ahead, the Millennium Bridge glistens like a spiderweb, far more delicate than all the bridges I have run past so far. 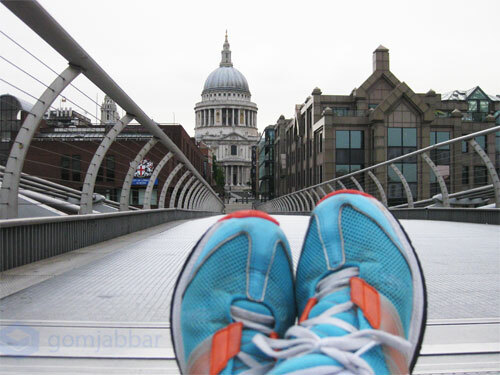 Running across the Millennium Bridge, the steel chinks softly against my sneakers. In front of me, my two favorite places in Southwark: the Tate Modern and Shakespeare’s Globe Theatre. The Tate Modern’s housed in what used to be the Bankside Power Station from the ’50s. All industrial red brick. The Globe Theatre, with its thatched roof and wattle and daub exterior, was built in the image of the original Globe from the 1600s. When I reach the southern end of the bridge, I turn and see Christopher Wren’s iteration of St. Paul’s Cathedral at the north end of the bridge.